CAP awards have and continue to play a substantial role in promoting and disseminating the tenets of the NSDI to thousands of SDI advocates and practitioners. To date, the NSDI CAP awards have created collaborations at all levels of government, developed an understanding of geospatial information in organizations and disciplines new to the NSDI, provided seed money to enable geospatial organizations to participate in the national effort to implement the NSDI, promoted the development of standardized metadata in hundreds of organizations, and funded numerous implementations of OGC Web Mapping Services and Web Feature Services. As in past year the geospatial community not only benefited financially from NSDI cooperative agreements in FY2014 but more importantly validated organizational geospatial initiatives, which opened new opportunities. This year saw the conclusion of 18 CAP projects. Training and outreach continued to be valued outcomes of the program. The Sonoma Ecology Center's metadata training reached a wide range organizations and individuals in California. One project investigated the transition from FGDC Content Standard for Digital Geospatial Metadata (CSDGM) to internationally accepted geospatial metadata standards (ISO 19115). Other FGDC-endorsed standards promoted this year were the National Vegetation Classification (NVC) Standard and the Wetland Mapping Standard. The standard for Cadastral Data Content benefited from the development of a draft implementation model in Extensible Markup Language/Geographic Markup Language (XML/GML) for parcel data. Oregon held several successful outreach efforts to introduce the benefits and capabilities of sharing data catalogs using open standards and developed training materials available at www.coastalmarinedata.net/resources. As part of the Fifty States Initiative, three projects were completed in Maine, Maryland, and Nevada to advance each State’s geospatial business plans. Maine's orthoimagery business plan implementation resulted in greater community involvement, especially in small communities and rural counties. Maryland's plan focused on activities necessary to support the creation, expansion, and widespread distribution of statewide parcel data. Nevada completed business plans for statewide parcel data and enhanced elevation data, which both point out the need for a single organization to set priorities for geospatial data at a statewide level and coordinate strategies for data acquisition and dissemination. And finally three Geospatial Platform Cloud Service Testbed projects were completed and provided valuable information about the deployment costs and performance characteristics of secure geospatial cloud services at the State and Tribal levels. This year, 19 CAP projects concluded. As in past years, training and outreach continued to be valued outcomes of the program. Over 240 individuals received metadata training through a number of workshops that were offered in Arizona, Florida, and Iowa. Many Native American tribal representatives attended the Arizona workshops. Use of the ISO geospatial metadata standards was promoted by the Northwest Straits Commission and the FGDC United States Thoroughfare, Landmark, and Postal Address Data Standard was enhanced through the development of two prototype applications. Furthermore, the wetlands science community developed technical recommendations to address key technical challenges referenced within the FGDC Wetland Mapping Standard and in its implementation plan. In an effort continue the expansion of the NSDI Clearinghouse, Maryland conducted a successful campaign to populate the National States Geographic Information Council’s (NSGIC) GIS Inventory System (also known as Ramona). States agencies from Massachusetts, North Carolina, and Oregon addressed issues of integrating and sharing geospatial data to expand the use of best practices within their states. Five Fifty States Initiative projects were completed in Louisiana, Minnesota, Nebraska, New Jersey, Utah, and Wisconsin. These projects resulted in strategic or business plans for advancing geospatial planning activities in these states. As the Louisiana Geographic Information Center (LAGIC) was completing its business plan for statewide address management, it simultaneously championed the importance of the FGDC United States Thoroughfare, Landmark, and Postal Address Data Standard. Minnesota produced a detailed business plan for acquiring, integrating, managing and providing access to accurate, current, and consistent parcel data for the entire state—a system that is based on maintained and authoritative county sources. Nebraska developed an enterprise-level strategic plan to guide the development of the state’s spatial data infrastructure. New Jersey created a strategic business plan that makes the business case for improvements to its “core four” data sets, for new investments in the modernization of the New Jersey Geographic Information Network (NJGIN), and for evolution of governance in the state. Utah’s Automated Geographic Reference Center launched three initiatives to support its strategic objectives for the state’s spatial data infrastructure. Finally, Wisconsin completed a business plan that summarizes the current state of aerial imagery projects in the state, proposes a number of unique models that could be used to implement an imagery program, and identifies the broad steps needed to build the program. Other significant CAP projects that were successfully completed included Return on Investment (ROI) studies by Maine, New York, and Oregon. Maine conducted a cost-benefit analysis of a statewide orthoimagery program, projecting that the return on investment would range from 421% to 1264%. New York also studied its orthoimagery program and concluded that without the statewide program, many public and private users would be challenged in carrying out their essential functions, and if they were indeed able to carry out those functions, their costs for doing so would be much higher and the quality of their services or products would be lower. The ROI study in Multnomah County, Oregon focused on two GIS platforms used for emergency response. They reported that in the past year, the benefit-cost ratio for one platform was 6.73:1 and 3.48:1 for the other, showing a significant advantage for the use of the emergency response platforms. In FY2012, 21 NSDI CAP projects posted their final reports on the FGDC web site. Training and outreach are still a critical component of the CAP. Over 150 people participated in metadata training that was provided in person and via a series of webinars. The Appalachian Ohio Geospatial Data Partnership provided educational opportunities for their community to share cadastral date at the local, regional, state, and federal levels. The Association of State Wetland Managers, Inc. was able to partner in organizing the Wetland Mapping Consortium and develop wetlands mapping training modules based on the wetlands standards. Standards development was highlighted by the advancement of the Coastal and Marine Ecological Classification Standard (CMECS) to the final draft stage in the FGDC standards approval process. The three Geo-Synchronization projects were successful in developing and deploying a federated approach for exchanging framework data between state and national data stores. In addition, Minnesota designed and implemented the first tangible stages of a collaborative and streamlined approach to manage municipal and township boundary data. Under the Fifty States Initiative, Alabama, Alaska, and Ohio completed strategic and business plans and the District of Columbia, Florida, Idaho with Montana, Massachusetts, New York, Tennessee, and West Virginia completed business plans for specific datasets of interest. Finally, geospatial infrastructure return-on-investment studies were completed by Iowa Geographic Information Council and MetroGIS in Minnesota. The 27 CAP projects completed in FY2011 demonstrate the program’s diversity. The GeoCommons platform was extended to enable it to dynamically georeference Federal government tabular data which will allows the data to be discovered, accessed, and applied in its geographic context. Four projects developed client/server-mediated applications that can access, search, and exploit the geospatial data and services referenced by the Geospatial One-Stop Portal to support specific geographic or discipline requirements. Illinois, Indiana, and Missouri created or enhanced numerous partnerships between regional and local governments, and demonstrated viable solutions to solve data interoperability problems. Projects in Alaska, Michigan, Montana, and Utah focused on building data stewardship for transportation geospatial information. Complete guides to the National Vegetation Classification Standard (Version 2) were developed for on-line and in classroom use, see http://mtnhp.org/ecology/nvcs/. Finally, over 141 people were introduced to metadata concepts though a variety of workshops and on-line and in person presentations. In fiscal year 2010, 22 CAP projects were completed with a Federal contribution of $1,185,000. As in past years the projects continue to demonstrate the program’s diversity. Through the Fifty State Initiative eight States completed geospatial strategic and business plans for their State. Three service-oriented architecture projects successfully demonstrated and documented (1) best practices for wetland permitting, (2) estimating flood-related property losses, and (3) role-based access control. The Cross-Border SDI Project made significant progress deploying new online data, services, and applications to support critical infrastructure identification-using a common spatial data infrastructure for Canada and the United States. A project by Innovate!, Inc. developed an external application to access the GOS data catalog through Web Services. The Minnesota Structures Collaborative established partnerships and developed the technical capacity needed to support the long-term collection, publication, and maintenance of databases pertaining to structures. Delta State University and the North Carolina Center for Geographic Information and Analysis completed stakeholder training materials for the U.S. National Grid. Finally, over 240 people were introduced to metadata concepts though a variety of workshops and presentations. These analyses provide strong evidence that grants have been effective and useful for advancing the objectives of NSDI at the state-level and, by extension, advancing state contributions to the NSDI. These indications are particularly evident in the results of a survey of Fifty States grant recipients as well as in the case studies. In addition, the GIS Inventory and the Geospatial Maturity Assessment efforts are discussed. Ways to make sure that meaningful measures on grant outcomes are captured in a consistent manner would help measure the overall progress on geospatial coordination and the effectiveness of the Fifty States Initiative. The emerging Geospatial Maturity Assessment (GMA) model holds potential and promise in this regard. See the full report here (PDF format). 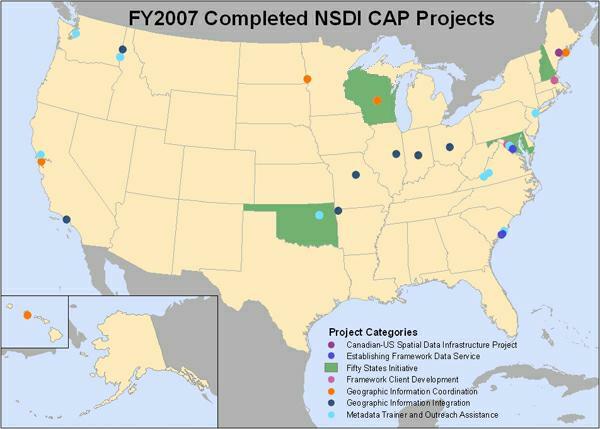 Between October 2008 and mid-July 2009, twenty-six National Spatial Data Infrastructure (NSDI) CAP projects were completed. The Federal share for the awarded projects was close to $1.3 million, and the in-kind match from the recipients was over $1 million, bringing the total value of the awards to $2.3 million. Highlights of the completed projects within each category are below, along with links to more detailed project information. More than 30 metadata workshops, presentations, and academic curriculum consultations were conducted through CAP projects, training over 550 individuals from across the United States with diverse backgrounds, experience, and knowledge. The workshops were held in a traditional classroom setting and via the Internet. Metadata training and outreach materials that were developed are available on-line from Innovate! Inc., Sonoma Ecology Center, and Indiana University. Eleven Fifty States Initiative projects were completed. The States that completed strategic and business plans are: Idaho, Illinois, Missouri, and Utah. Strategic plans were completed for the District of Columbia, Georgia, New York, Pennsylvania, and Texas. North Carolina developed the business case for NC OneMap and Iowa completed a Strategic Return on Investment Business Plan for Iowa Geospatial Infrastructure. Missouri created a “How to” guide designed to help local governments with geographic information technology. Idaho developed an executive summary presentation which can be tailored to a variety of audiences, and a brochure for quick introduction to the Idaho SDI initiative. Pennsylvania created a presentation for a May 2009 Pennsylvania GIS conference. 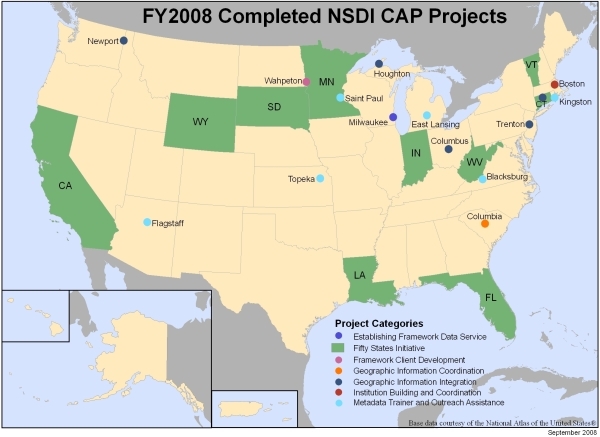 Twenty-five NSDI Cooperative Agreement Program (CAP) projects were completed in fiscal year 2008. Funds totaling just over $2.4 million (federal share just over $1 million and agency in-kind match well over $1.3 million) were expended. Below are the highlights of the completed projects. More details are available in the individual projects final reports which are available at via the Project List pages – 2007, 2006, 2005, 2004, and 2003 (The project outcomes span multiple years due to different project performance years and requests for no-cost extensions). More than 30 metadata workshops were conducted that trained over 500 individuals from across the United States in a wide variety of organizations. Materials for on-line metadata training were developed by Mid America Geographic Information Consortium, Michigan State University, and Virginia Geospatial Extension Program. Implemented a Web Feature Service (WFS) server sharing transportation data in Wisconsin. Minnesota, South Dakota, and North Dakota partnered to promote shared client framework development and data services among the States and their local government organizations. The client framework is GeoMOOSE which was started by the City of St. Paul, MN. Ten Fifty States Initiative projects were completed. The States that completed strategic plans are Wyoming, Vermont, Florida, Connecticut, California, Louisiana, Minnesota, and South Dakota. Business plans were completed for Wyoming, Vermont, South Dakota, Connecticut, and West Virginia. Here are some additional details about the completed projects. The Indiana Geographic Information Council (IGIC) completed a return on investment (ROI) study to support the business case for funding of Indiana’s spatial data infrastructure, the IndianaMap. The ROI demonstrated that over $1.7 billion in Indiana projects and programs are supported by the IndianaMap. Wyoming created an eductional outreach brochure. South Carolina created a central gateway to geospatial information called My South Carolina Map and established a formal agreement among 11 State agencies and local governments. In Boston Phase 1 of the regional data repository was completed and is known as the MetroBoston DataCommon. New Jersey developed statewide datasets and developed and began hosting OGC-compliant WMS with metadata and WFS. In Washington, Pend Oreille County formed a GIS consortium and is providing integrated OGC-compliant geospatial datasets to the NSDI via The National Map. With a partnership between Ohio State agencies and the Federal Government, Ohio published a WMS for high-resolution imagery to the GIServOhio portal, The National Map, and the Geospatial One-Stop portal. Through the Connecticut Geospatial Information Systems Council (CGISC), Connecticut initiated the coordination of State geospatial information with the goal to serve latest geospatial information to the public via a web portal. Michigan's Western Upper Peninsula Planning & Development Region established a regional geospatial framework organization and completed the installation of ArcIMS and have made geospatial data for the region discoverable via GOS. It has been a very good year for the NSDI Cooperative Agreement Program (CAP) with the completion of 31 projects which had been awarded during the 2005 and 2006 CAP seasons. Funds totaling just over $2.5 million (federal share $1.2 million and agency in-kind match $1.3 million) were expended. The results of the projects demonstrate their great diversity both in geography and in scope. Over 27 metadata workshops were conducted that trained close to 400 individuals from across the United States in a wide variety of organizations. Materials for on-line metadata training were developed by Virginia Tech and will be posted on the NBII portal when it is available. 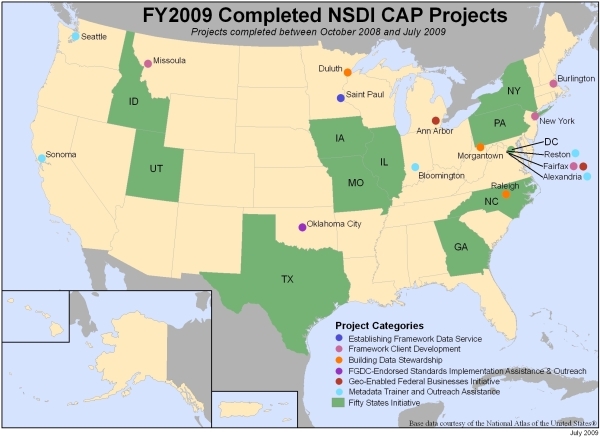 NSDI Clearinghouses were established, developed, and/or expanded for State of Virginia, local agencies in New York City, Idaho GIS community, North San Francisco Bay Initiative, State of Oklahoma, Japan’s Marine Information Research Center, National Oceanic and Atmosphere Administration, and National Biological Information Infrastructure. Web Feature Services for national scale hydrography, political boundaries, and transportation framework data were established by GeoLeaders, LLC using the data models from the draft ANSI Framework Data Standard. Two projects developed and documented freely-accessible map client software that can accessing, visualizing, analyzing, and sharing framework data from Federal, State, and local data sources. Geospatial Strategic Plans for the States of Maryland, Oklahoma, Wisconsin, and New Hampshire were completed. Established or supported the multi-organizational collaboration to share geospatial information in a variety of communities in regions and organizations like the Southern Red River Basin, the California Invasive Plant Data Consortium, Coastal Maine, the Pacific Ocean area, Indiana, Missouri, Ohio, and Maine-New Brunswick (Canada) border. Web Mapping Services for Native names; Indiana orthophotography and elevation; Chicago Urban Area orthophotography; Idaho roads, structures, boundaries, and imagery; Benton County, Arkansas; and California’s Channel Islands Region GIS were established and are available via The National Map and registered in Geospatial One Stop. Missouri's local governments delivered a mirrored site for The National Map. Three Train the Trainer Workshops conducted by grant recipients: USGS's National Biological Information Infrastructure (NBII), the NOAA Coastal Services Center, and the Center for International Earth Science Information Network (CEISIN) at Columbia University. In all, 34 metadata trainers were prepared to train larger groups. Creation of training opportunities for more than 330 people within city, county and Tribal government entities – including public health and emergency response organizations – by the NBII, the Merriam Powell Research Center at the University at Northern Arizona, the University of Idaho, the University of Indiana, Columbia University and the government of Westchester County, NY. Saving more than $8.5 million in staff time through the Minnesota Geographic Data Clearinghouse. Configuration and deployment of Web Feature Services (WFS) by Vermont, Rhode Island, Minnesota, North Carolina, and the Center for International Earth Science Information Network (Columbia University) to support NSDI Framework themes, including Governmental Units, Hydrography, and Transportation. Providing seed funding to Wisconsin to promote the advantages of a shared spatial infrastructure within that state. Helping the Tennessee Valley Authority provide access to its Aerial Photography Index via an OGC Web Map Service. Supporting South Carolina’s establishment of a user-friendly geospatial portal that is an outstanding return on investment. Helping the California Geographic Information Association bring together national, state, regional and local organizations to draft a comprehensive regionally-relevant, nationally consistent framework data plan. This provides the foundation for a California GIS Council data plan and will be used to promote the FGDC’s “Fifty States Initiative”. Under the leadership of the Wisconsin Department of Natural Resources, completion of high-resolution hydrologic units, which were added to the National Hydrology Database. Helping the University of Oklahoma incorporate local data into the development of high-quality street centerline data. • 95% indicated that the FGDC grants program had contributed significantly to the success of their metadata projects. • post-FGDC-grant investment in project development/maintenance averaged $22,000 per annum per applicant. • more than half of the grant recipients indicated that their FGDC- related project had created spillovers to other organizations (demonstration effects were positive). • FGDC grants typically covered between 50-60% of project costs for most applicants. • most applicants were from the government sector, with few from the private sector. • FGDC grants were ranked highly in terms of their contribution to project success. • most grant applicants (71%) were first-time applicants. • all of the successful applicants have established web-based clearinghouses to support metadata dissemination. • a majority of the organizations that were surveyed intend to apply for FGDC funding in the future. • most applicants would have proceeded with their projects in the absence of FGDC support, albeit at a slower speed or at a reduced scope. • 32% indicated that their project would not have proceeded without FGDC funding (most of these applicants operate with very small GIS units). • unsuccessful applicants typically employed smaller numbers of GIS personnel than successful applicants (this contrast is statistically significant). • approximately half of the organizations that were denied FGDC funding proceeded with some variant of their original proposal. • because of their limited in-house resources (GIS expertise), unsuccessful applicants were more likely to seek outside help from professionals in other organizations, including private consultants, academics, and other collaborators. Overall, the picture that emerged from the analysis was summarized as follows. First, FGDC grants contribute significantly to the development of metadata clearinghouses among successful applicants. The existence of a critical mass of in-house GIS specialists appears to be the chief discriminator between successful versus unsuccessful applicants. Second, projects that were supported by FGDC were in most cases associated with spillovers to other organizations (demonstration effects). In addition, virtually all of these projects have been supported by post-grant investment from within the recipient organization itself. Third, FGDC grants have improved the in-house technical capacity (or broadened the range of in-house activities) of many of the grant recipients. Fourth, all of the successful applicants have created metadata clearinghouses. A substantial majority of the successful applicants ranked the importance of FGDC support either highly or very highly. Finally, the main reason that eligible non-applicants failed to submit proposals was that they were unaware of the existence of FGDC grants. The full report is available here (PDF format). This information was also published in URISA Journal Volume 15, Number 2. See the full report here (PDF format, 1.2mb) that describes the results from projects conducts from 1994 to 1996.